Ever since we discovered Grace Garden, we seldom eat Chinese food anywhere else. But what do we do if we get a craving and don't feel like jumping in the car for a 45-minute drive? Sometimes we make it (or a reasonable facsimile) ourselves, but sometimes we bite the bullet and eat somewhere that's not Grace Garden. There are tons of American-style Chinese restaurants in the Towson area, and most of them have stuffed a menu in our door handle at some point or another. We used to save them, but eventually figured there was no use in that. So for our most recent Chinese food craving we just pulled a name out of the air. "China Wok," seemed like a place that might exist in Towson, and indeed it does. I looked it up on Urban Spoon, checked out the photo of the menu attached to the listing, and called in an order for delivery. Delivery is always tricky. Will they find our house in our neighborhood of crazy one-way streets? Will the food still be hot? Will it have slopped out of its containers all over the inside of the bag? The answers to those questions, in the case of China Wok, are "yes," "yes," and "no." Within a half hour, we had a bag of steaming hot goodies packaged so neatly that nary a drop of anything was spilled. 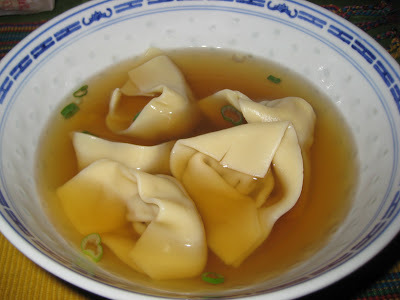 We got a quart of won ton soup that had ten porky/garlicky won tons in a nicely flavored broth. Pretty damn good for $2.35. 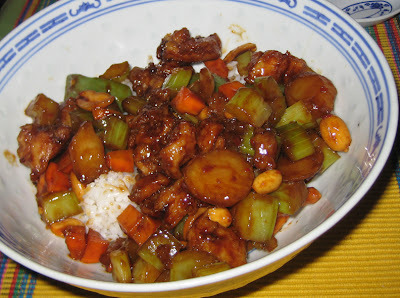 Mr Minx ordered his customary Kung Pao chicken. The chunks of chicken with diced celery and carrots and the occasional slab of green bell pepper looked and smelled great. The meat was ridiculously tender and the veggies crisp, but unfortunately, apart from some heat, the dish didn't have much flavor. I thought it almost tasted like Old Bay. 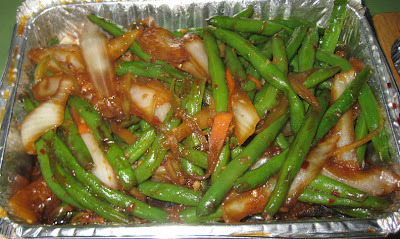 We also got an order of Szechuan string beans, which were nicely cooked, garlicky, but not spicy. I rook the risk of ordering the vegetarian Moo Shu. It was risky because every time I've ordered moo shu from Szechuan House, it's smelled like something scraped out of an elephant's backyard. It always tasted fine, but the smell was offputting and I had never noticed it at other restaurants. 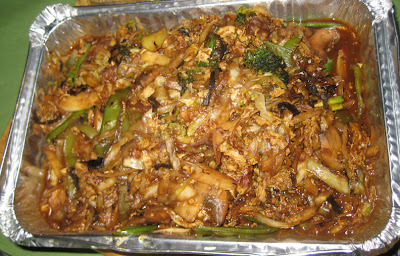 Happily, China Wok's moo shu both smelled and tasted fine. Delicious, even. While the kung pao wasn't up to snuff, the rest of the meal was pretty good, including the free order of crab rangoon that I originally thought were fried noodles for the soup. And we now have a lifetime supply of packets of mustard, duck, and soy sauces. China Wok's no Grace Garden, but it was definitely worth trying. Might have to order Chinese more often.